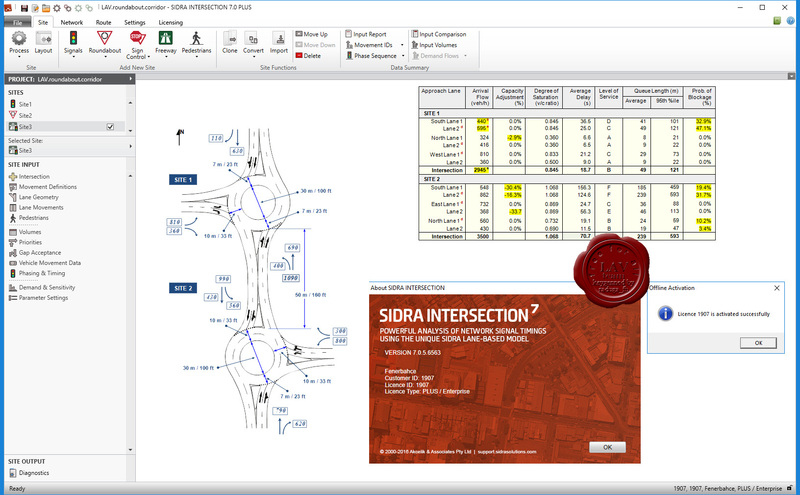 Akcelik SIDRA Intersection is powerful traffic engineering software used by transport professionals in 90+ countries across the globe. These tools have been created to help achieve better solutions to challenges in the areas of road traffic operations, traffic engineering, management and control. Network signal timing calculations (Cycle Time, Phase Times, Signal Offsets). Common Control Groups for multiple intersections under one signal controller. Routes for performance reports and displays, and for signal Offset calculations. Route Output Comparison and Network Output Comparison by Routes. Larger number of User Movement Classes. New option for "HCM Edition 6" roundabout capacity model. "Convert (Batch)" function to convert old version Project files. "View Layout" function with lane highlighting in Lane Geometry, Lane Movements and Roundabouts input dialogs. A large number of user interface improvements including new output reports and displays.